FALLS CHURCH, VIRGINIA – February 5, 2018 – PropelUAS™, a division of Evans Incorporated, announces today that it is partnering with Medical Express Ambulance Service (MedEx) in the unveiling of a high-tech “Concept Ambulance” that integrates Unmanned Aircraft Systems (UAS), or “drones,” into its collection of life saving technologies. The concept vehicle will be displayed at the upcoming 2018 Chicago Auto Show, this February. PropelUAS™ is providing UAS-related expertise to determine the benefits and the future of UAS integration with traditional apparatuses used in the emergency response vehicles. Together with MedEx, the team is addressing numerous challenges, such as the ideal drone configuration for this integration, operational considerations for emergency response, and navigation of airspace regulations. PropelUAS™ is collaborating with Lockheed Martin and MedEx to combine the very best elements of emergency management systems with the potential of tactical UAS. Lockheed Martin’s sophisticated unmanned systems are used for a variety of lifesaving military, first responder and civil applications. PropelUAS™ partners with organizations to assist in navigating and integrating UAS technologies into their organizations. As a division of Evans Incorporated, it is uniquely positioned to assist Emergency Responders, such as MedEx, after years of supporting the Federal Aviation Administration with the integration of UAS into the National Airspace System. PropelUAS™ uses its IDEA-OPS™ methodology to take organizations from ‘Idea’ to ‘Operations’ and ensure ROI – Real Operational Impact™ in all facets of UAS integration. It does so by leveraging decades of experience and knowledge in aviation, air traffic, operations, and business consulting. The ambulance and drone will be on display at the auto show during the media preview days. However, only the ambulance will be on display for the remainder of the show (February 10th – 19th). On days when the drone is not on display, a video demonstrating the abilities of the drone will be viewable along with the ambulance. To schedule an interview, please contact Matthew Potter at 301-230-0045 ext. 300 or mpotter@rmr.com. 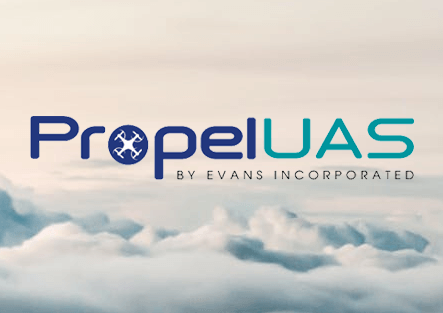 PropelUAS™ is a division of Evans Incorporated that takes organizations to new heights by leveraging 20+ years of aviation industry expertise, as well as a dedicated team of unmanned systems, air traffic control, aviation training, human factors, and airport experts. PropelUAS™ differentiates itself from key competitors in its ability to operate as an innovative ‘translator’ across the UAS program implementation process, to navigate key regulatory considerations, and maximize outcomes within a larger operational context. Evans Incorporated also has unique experience supporting the Federal Aviation Administration with its integration of UAS regulations into the National Airspace System. Coupling this experience with its team of experts, PropelUAS™ provides an unparalleled service in numerous industries where UAS technology has the potential to shift the marketplace. Example industry segments include Law Enforcement, Emergency Management, First Responders, Security, State and Local Government, Oil and Gas (Energy), Industrial Inspection, Construction, Telecommunications, Media, and Agriculture. PropelUAS™ is a ‘game-changer’ that drives unmatched expertise and value to advance the UAS industry and technology from ‘Idea’ to ‘Operations’ (IDEA-OPS™). For more information about PropelUAS™, please visit www.PropelUAS.com. In years past, MedEx displayed its innovative use of Google Glass that drastically improves communication between critical care paramedics and hospital emergency rooms. MedEx also introduced an ambulance specifically designed to complement University of Chicago Medicine’s UCAN helicopter service by integrating aviation technology into the ambulance. “We’re proud to be here at the 2018 Chicago Auto Show with our partner Ford Motor Company to show off our “Concept Ambulance,” said Lauren Rubinson-Morris, MedEx President and CEO.